There comes a time in every LEGO collector’s life when a set escapes our grasp. It either retires or sells out, and we miss the opportunity to have it in our collection. The White Whale sets – the ones that got away – will bring a variety of emotions with it, depending on the person. For some, they will bring pain, loss and heartache, for others a crazy drive to get it at all costs, and for still others, a small sense of regret mixed in with excitement for what can fill that void. 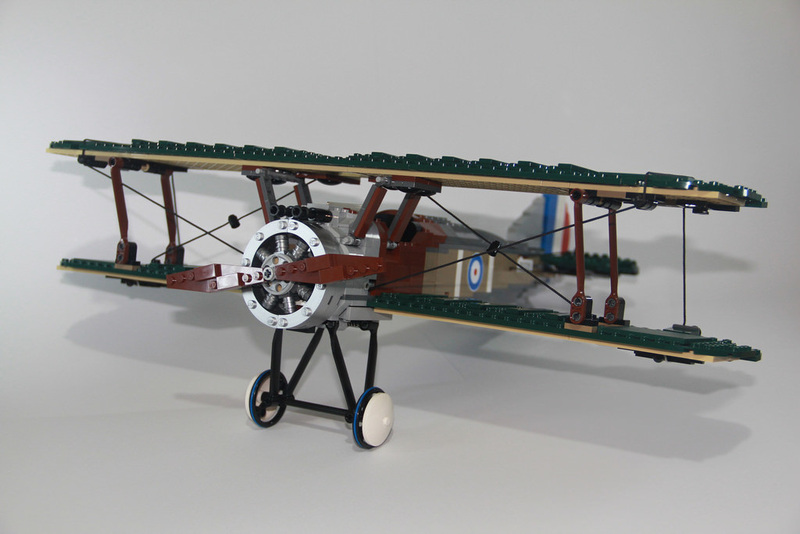 10226: Sopwith Camel was my White Whale. A couple of years ago, I was ready to purchase. I had the cash saved up, and a day before I was ready to order, it retired. I was devastated. 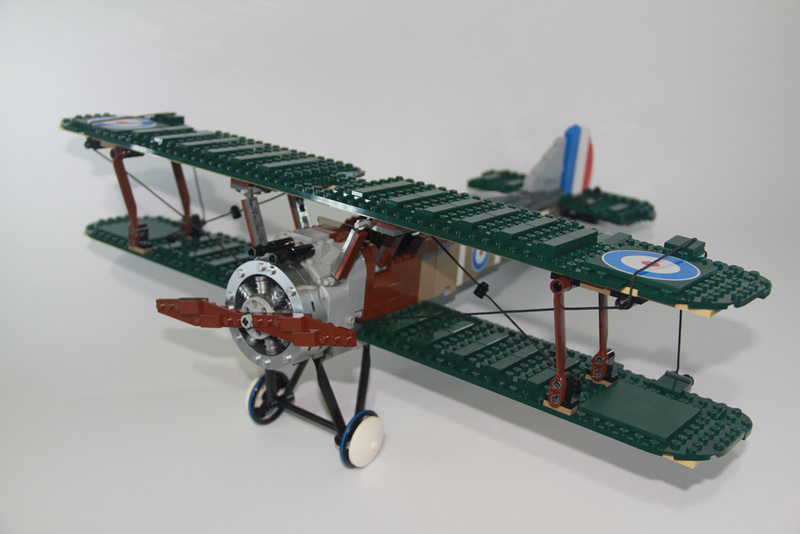 I knew that it would be the last time I saw it at the RRP, but I was determined to have this bi-plane in my collection, so I kept a keen eye out for it on a few secondary markets. A couple of months ago, it re-appeared. It was going to set me back $200, but I was determined that it would be mine! I asked the seller to save it for me while I scrounged up the money, and then a few weeks later, I had it in my hot little hands. I couldn’t contain my excitement! I came into the house screaming with delight to my wife “It’s here! I’ve finally got it! It’s mine!”. I opened the box as soon as I could, and got stuck into it. Read on to see what I found! Firstly though, a quick history lesson on this mechanical marvel. The Sopwith Camel was incredibly valued in World War One, taking the mantle of shooting down more enemy aircraft than any other plane. It was supposedly very hard to fly, with it being very front-heavy. This in turn though, made it highly manouverable. The pilots were fearless! 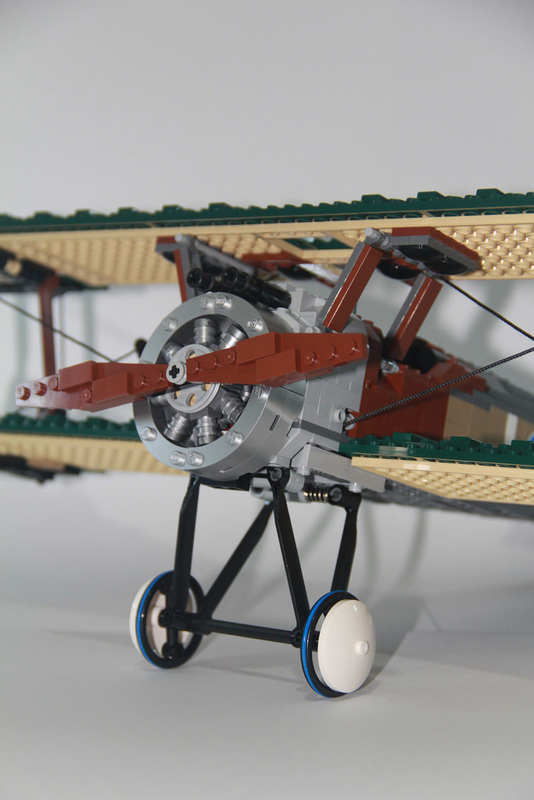 Just like the model, the cylinders in the plane’s engine rotated around the crank of the engine, helping cool it. Another clever invention with this plane was the special gear that stopped the guns directly behind the propeller from riddling the props with holes. When the blades were in front of the guns, it couldn’t shoot, so the pilot could be nice and trigger happy without bringing his own plane down in the process. But enough of that, let’s take a look at the set. The big drawcard with this set are the colours. 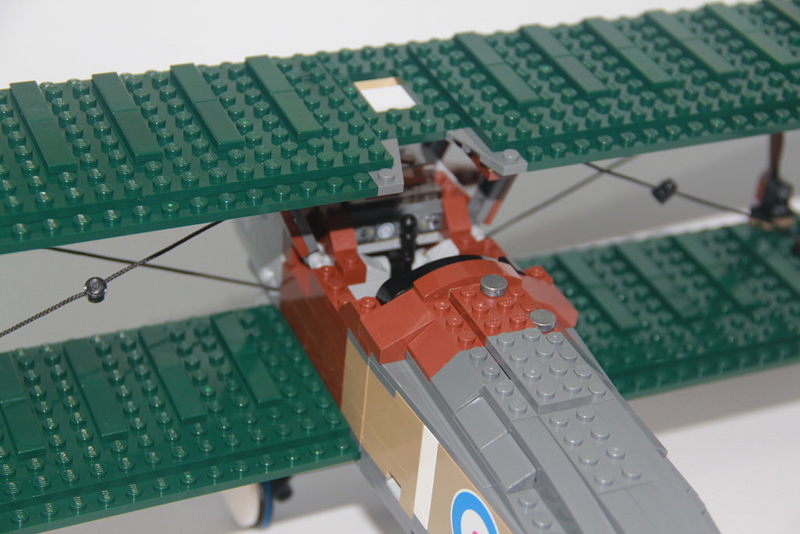 The beautiful dark green or Earth Green of the wings is not only very easy to look at, but the larger parts like the 2×16 and 8×16 plates, as well as the big 6×6 tiles are still unique to this set, as well as the black steering wheel rims, used as the wheels of the plane. The brown suspension beams, used as supports for the two wings are quite hard to come by, having only been seen in one other set, interestingly from another hard to find theme in The Lone Ranger series, 79108: Stagecoach Escape. 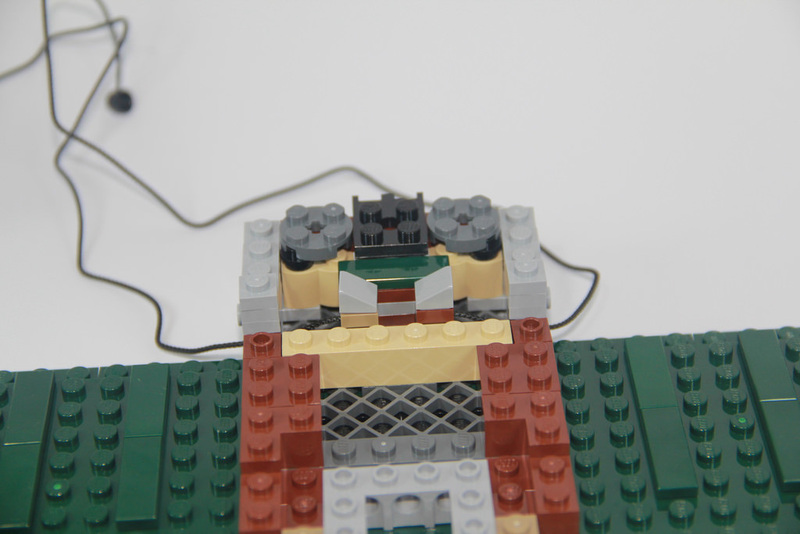 There’s a lot of angled and bowed plates and bricks, a large number of 1×4 plates with ball joints, and a lot of string! Aside from the earth green is the sand yellow, or dark tan parts that make up the fuselage of the plane. These two colours come in a huge variety of parts. 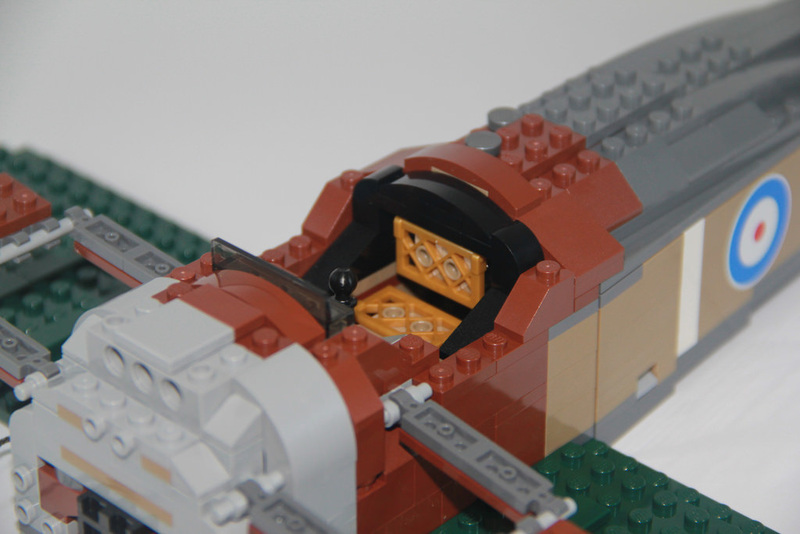 There’s also a large selection of rubber bands, and the metallic parts, including the eight curved bricks that are used in the engine cowling. This set has an incredible selection of parts. If you were lucky enough to get a second copy of this set as parts stock, then you were in for a treat! There are a few stickers, but they were pretty decent, having added a lot of nice little detail to the set. It’s the sole reason for a score of 19, and not 20, though. A note regarding this step though – when the tail ailerons are connected to the string, it’s quite tight, so it will pull them up quite harshly. I didn’t realise that the rubber bands were included in the set, so I (very incorrectly) assumed this was a slight error on LEGO’s part. How naive I was! Attach the rubber bands underneath, and they’ll pull the ailerons back into a flat position. It’s quite clever, and I’m very sorry I doubted you, LEGO. I honestly cannot fault the swooshability of this set. It’s genius. I absolutely love it. You’ll start off with the very front of the fuselage, where the rotary engine will eventually be connected. It’s a great place to start, as you’ll build the mechanism that controls the strings. It’s very neatly hidden away, and quite clever. The next stage is the cockpit and wings. It’s great at this point to see just how big the set is going to be. This is always a very exciting stage for me, as I’ll get a better idea of the final product. Next up is the base of the tail section. It’s pretty simple, as it’s really just a housing for the string mechanism. The walls of the tail are quite interesting, as they’re created separately, and attached via some hinge plates. It’s pretty simple, with bricks on bricks, but it’s still a very effective way to have the tail taper off. It’s far from unique, as it’s a commonly used technique, but nonetheless, very effective. The tail and rudder are attached, followed by the strings, and then the engine and wheels to finish. The engine is the only part of the build that’s a little repetitive, but it’s a very minor part of the build, so it’s barely noticed. All in all, it’s a great set to build. This set is nothing short of stunning. I’ve managed to hang mine up from the ceiling, and it looks superb. The beautiful colours, massive wingspan, and little details like the engine, guns and yes, even the stickers means that this set is absolutely perfect. I wouldn’t change a thing. You can expect to have to spend a bit more with this set, as it was quite popular, and has a good variety of rare coloured parts in it. For a BNIB set, you will need to fork out around $200. There are a few under that, but that’d be the ballpark figure. Used sets are slightly cheaper of course. You get some pretty fantastic elements in the collection, so the value for money is quite high, but the current price will send it down a little. 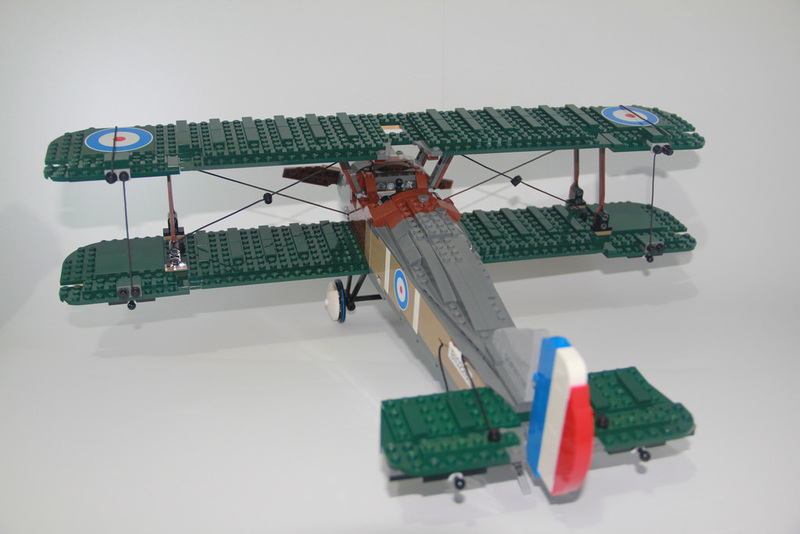 While this is by no means the only bi-plane LEGO has produced, it is possibly the best one. 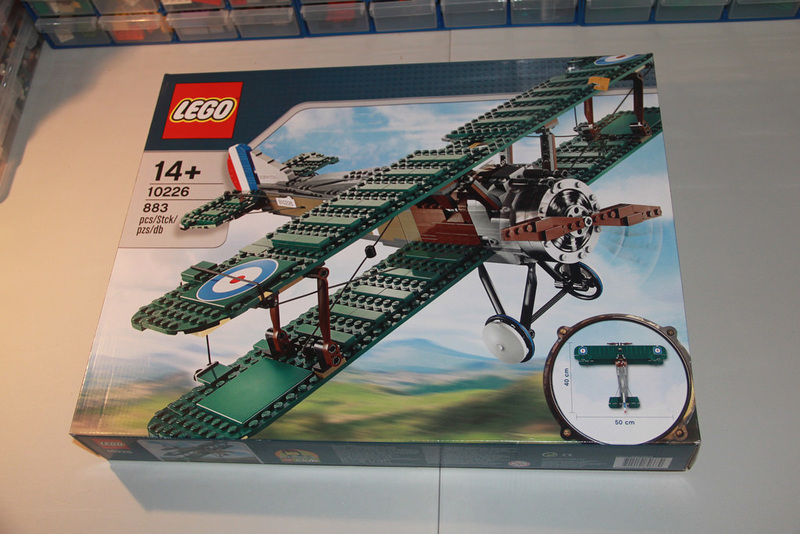 There have been two other Sopwith Camel sets in LEGO’s history – 3451 in 2001, and a mini version, the 40049 polybag in 2012. I don’t own 3451, but from the images I’ve seen, I definitely prefer this one. It’s more vibrant than grey, sand and brown. I do like the red engine housing, but the colour scheme in the current model seems much more authentic in my opinion. This set is very high on the collectible list, as the colours are very hard to come by, as well as the metallic elements and all that string. Definitely add this one to the must have list. This has become my new favourite set. I absolutely love it. 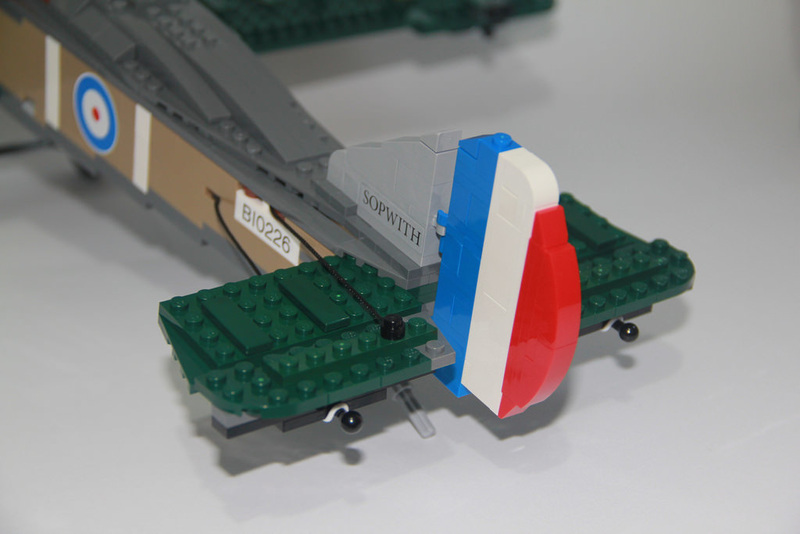 next week, I’m sticking with the dark green and checking out 10242: Mini Cooper Mk VII. Until then, happy building! When I came out of my Lego Dark Ages in 2015 this set was one of the first sets I had my sights on. I managed to get 2 boxes for only little over original RRP (each) from a German seller. Was very happy with it! Wow, I’d love to have two, just for the parts! That’s a great score!